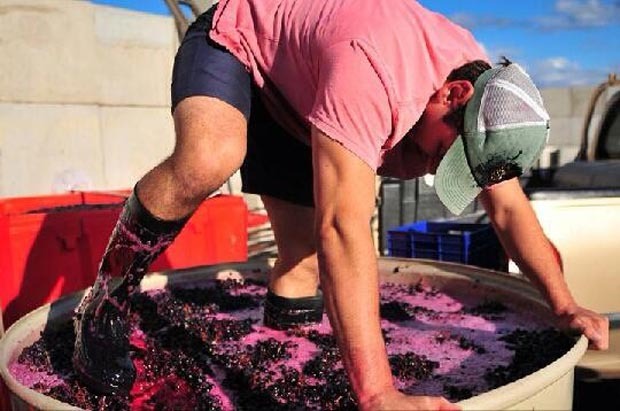 Doing it the old-fashioned way … Stuart Olsen uses his feet to stir up a red ferment. The Australian wine industry may be brimming with characters but it is essentially a fairly conservative place, with just about everyone pursuing clinically perfect wines. It's a goal that Stuart Olsen, who makes wine at Dubbo under the Eloquesta label, principally using fruit from Mudgee and Orange, reckons leads to a boring sameness. Eloquesta 2014 'A Boy with Fruit' Orange Chardonnay ($32): Winemaker Stuart Olsen certainly thought laterally when he made this wine and consumers will have to do likewise when they taste it. The fruit comes from the Orange district, in two equal-size batches — from Gordon Hills Estate on the Cargo Road and from the warmer, lower-altitude Belgravia Vineyard near Molong. It's made in an "antique style", as they did hundreds of years ago in places such as Croatia and Slovenia — foot-trodden on skins for two-to-three weeks, and pressed into old, new and reconditioned French oak and brand-new Hungarian oak, and matured for nearly two years. The barrels were stirred monthly on gross lees. It was only lightly filtered at bottling and retains some yeast sediment and hence potential cloudiness if stirred up —just like the best of Coopers ales. It shows a complex blend of fruit and associated flavours — Stuart sees dried stonefruit, mango, honey and acacia flowers in the bouquet, and I'm not going to disagree with him. It's a deeply golden-coloured, complex brew that won't be to everyone's taste but keen wine people will mostly love it for its uniqueness in Australia and the honesty of the winemaking approach. Grab a couple of bottles and share them with wine-loving friends over some hearty, strongly flavoured eastern Mediterranean seafood dishes. And please excuse the lengthiness of this review, but it's a provocative white wine worth study, contemplation and much discussion about whether our wines are generally overly pure and too sanitised. Visit eloquesta.com.au. Eloquesta 2015 ‘A Boy with Fruit’ Mudgee Rosalia ($22): This is another one out of left field. In Australia black muscat grapes are usually used to make frivolous pink moscatos and muscat liqueurs. Instead, Stuart Olsen has made a dry, quite aromatic rosé showing nuances of Turkish delight. It’s light, flavoursome, and good just about anywhere that doesn’t demand anything too serious. Rosalia, incidentally, is a Hungarian rosé festival — and the name of Stuart’s grandmother. Visit eloquesta.com.au.